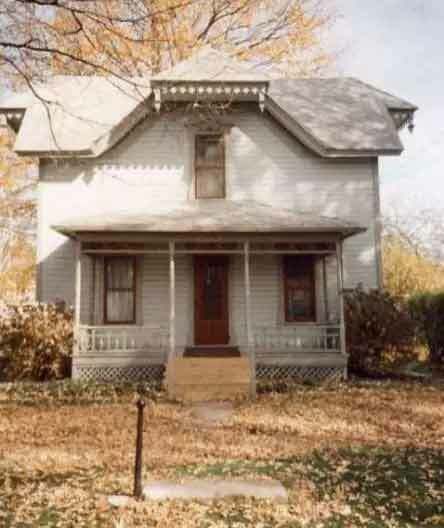 The Grand Ledge Area Historical Society Museum is housed in the Pratt-Shearer Cottage at 118 W. Lincoln Street. This Gothic cottage was built in 1880 by Byron S. Pratt, a local minister. Originally it was built at the corner of W. Railroad (later renamed Lincoln) and Harrison Streets. About twenty years later, c1900, D. D. Shane, local jeweler and ophthalmologist, bought the home and moved it over into the lot next door. He then built his much larger home on the corner lot. Purchased by Mary Shearer in the 1940s this was her home for several decades. Late in life, she sold her home to the United Methodist Church, who then gave her a life-lease to the property. After her death the Church rented the home until 1983. In 1984 the Church donated the building to the Historical Society for use as a museum. The Museum is open Sundays from 2-4 p.m. and all festival days. When the home was built, you would enter into a sitting room, with a door on your left into the parlor. Off the sitting room was a door leading into the dining room behind. The dining room featured two windows and a door to a side porch that originally faced Harrison Street. Tucked in next to the dining room is the small kitchen with built in pantry cupboard. Outside the Kitchen is the back porch. Once open, it has since been enclosed and features a weighted trap door to access the cellar. Off the sitting room was a door to a step stairway upstairs. The home had three bedrooms. Sometime in the 1920s there was a fire in the home. This fire damaged the interior causing a major renovation. The cottage was modernized during this time in the Craftsman style. The wall diving the sitting room and parlor was removed and the small door into the dining room was opened up into a wide-open doorway–creating a very open floor plan. The steep stairway was rebuilt with a landing which turned and ended in the sitting room. The dining room window facing the backyard was closed up. The back bedroom was converted into a bathroom and a closet. Finally, all the windows, doors and woodwork in the building were replaced. All these changes have created a very interesting building with the exterior Gothic and the interior Craftsman. The garage also dates from this time and is a wonderful example of an early double garage. When the Historical Society acquired the building, the front could not be seen. The entire building was hidden behind huge yew bushes that went up to the room. Only a small gap led to the darkened porch. The peeling paint was green with yellow highlights on the gable “teeth”. The bushes were removed, and the exterior painted in two shades of green with a burgundy accent. The inside was cleaned, painted, stenciled and made ready for its opening on May 20,1984. In 2002 the Society replaced the missing side porch off the dining room, equipping it for wheel chair access. An herb garden has been planted between the back porch and the garage. A carriage block and hitching posted where added by the curb. Such anticipation! Such excitement! Preparing for a wedding is a huge undertaking. In big cities and small towns, all brides and grooms and their families go through a similar set of rituals, traditions, and expectations. This exhibit will highlight the time of engagement to the time of the honeymoon trip. Many businesses will be highlighted that are connected to the wedding process: jewelers, newspapers, photographer, florists, bakeries, gift stores, etc. Ceremonies can happen in churches, City Hall, parks, and homes. Wedding gowns and men's suits, as well as family clothing for the special event (Mother of the Bride) will be displayed. Gifts to the wedding couple and furniture for the new home will be featured. And travel to the honeymoon will have its spot also. A beautiful time with beautiful adornments . . . this will be an exhibit you will not want to miss. Come one, come all! The Grand Ledge Area Historical Society Museum is fun for all ages! We hope to see you there! This exhibit begins in the spring and will be open through December 2018. Make sure to check out the Country Schools and Grand Ledge Sports displays at City Hall also. 2017 Exhibit – Hurray For School! © 2018 Grand Ledge Historical Society | All Rights Reserved.